Salsoul Records present a crate digging anthology of the more electronic, early 80's leaning side of their catalogue - 'An essential collection of early 80's post Disco electronic grooves from the Salsoul vaults'. Primarily a salsa label on it's inception, Salsoul delved into numerous styles throughout it's existence but this killer selection focuses on the period of time where music entered the 1980's and studio technology changed. 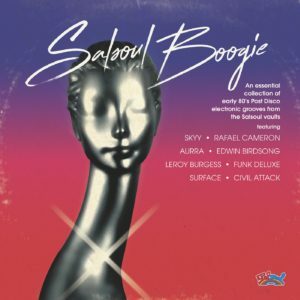 A plethora of funked out, dubbed out electronic Funk across 2 discs is what 'Salsoul Boogie' offers - Choice cuts from the likes of Skyy, Aurra, Leroy Burgess, Civil Attack and many more! Featured are the full 12" dance mixes for unlimited dance-floor pleasure. Mixes by Larry Levan, Shep Pettibone and Francois K feature. One cannot underestimate the importance of these tracks on contemporary dance music, but the Funk is the most important thing here, important tracks yes but also amazing records to dance to that capture a time in NYC when clubs were place to be, sanctuaries of escapism, hedonism and expression. Essential listening right here - 'Boogie's Gonna Get Ya'!